From 2021, manufacturers selling cars in Europe would have to pay an excess emissions premium of €33.6 billion. This is the conclusion of a JATO study based on last year’s averages and the fines set by the European Commission from 2019. If nothing changes in the next three years, be it good or bad, the top auto makers will face trouble as none of them are currently on track to meet the target. 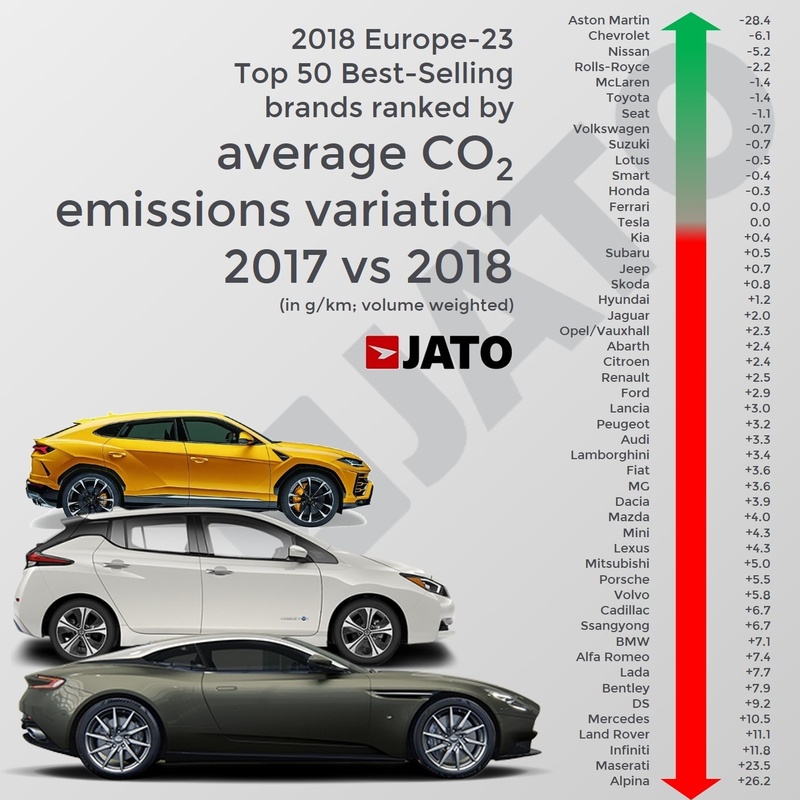 The incoming CO2 targets can be seen as the apocalypse of the car industry in Europe. 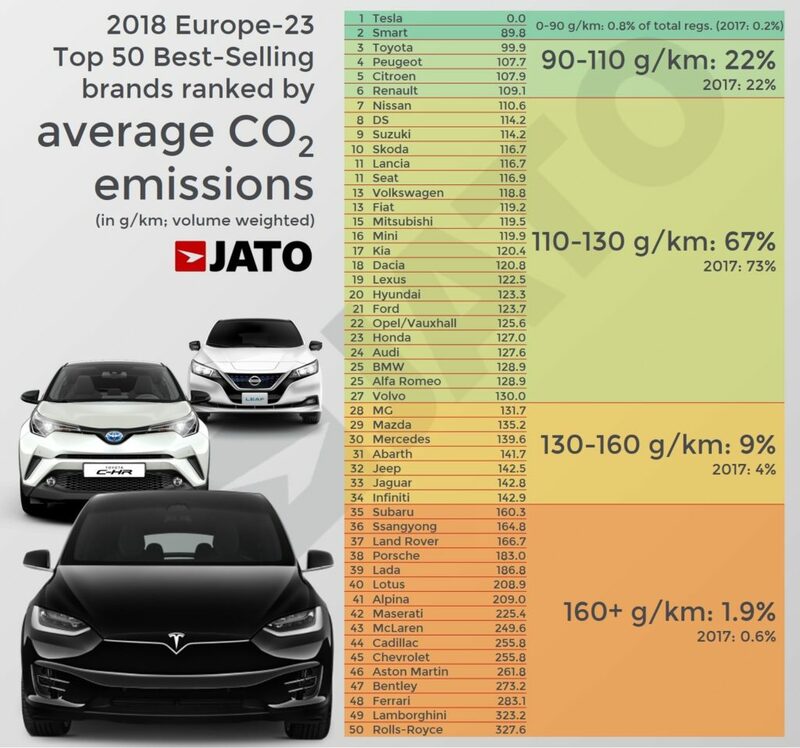 The authorities have made clear that by 2021, and phased in from 2020, the fleet average that all new cars must meet is 95 grams of CO2 per kilometre. That is 24.7 g/km more than the recorded average for the 11 manufacturers selling more than 300,000 units in 2018. An increasing gap between CO2 targets and reality. Last year the average emissions of Volkswagen Group, PSA, Renault Group, Nissan Group, BMW Group, Hyundai-Kia, Ford, FCA, Daimler, Toyota and Volvo gave a combined total of 119.7 g/km (volume weighted). The average increased by 2.4 g/km compared to 2017, with only Toyota recording a decrease. 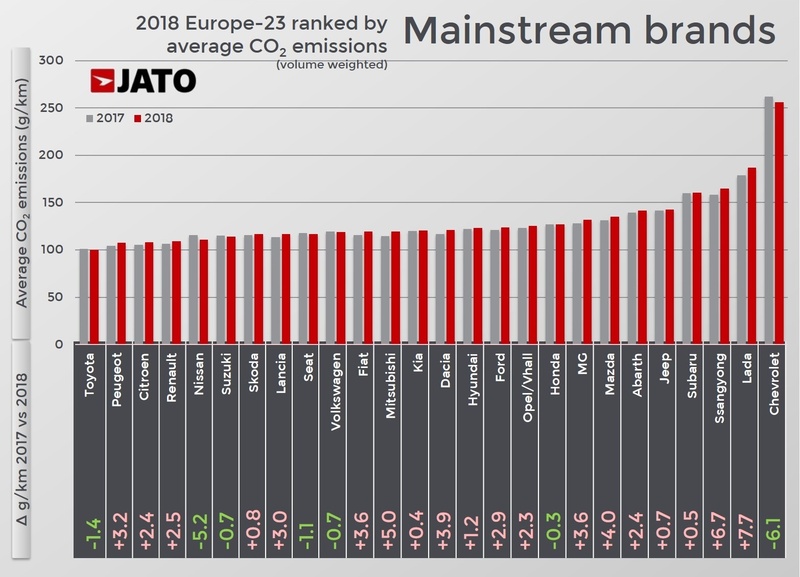 According to JATO’s data on annual results by brand released earlier this year, the trend confirms that the target is becoming increasingly difficult to achieve when taking into account the decreasing demand for diesel demand and more SUVs. Based on these numbers, the situation is quite disconcerting. When we look at all of the automakers operating in Europe (excluding the smallest ones), only four out of eighteen posted an improvement last year. Sales of these four manufacturers (Honda, Suzuki, Toyota and GM) counted for only 7% of the total in Europe-23. 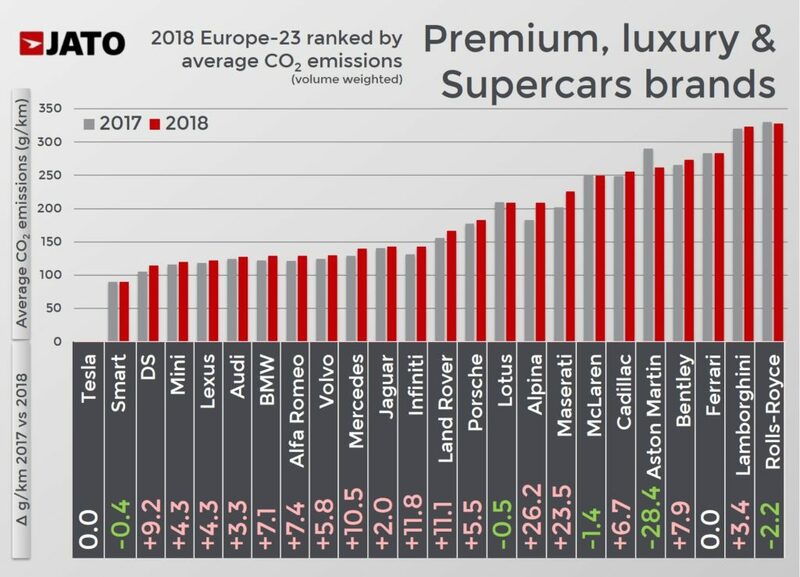 In contrast, the four worst performers were all premium makers (Daimler, JLR, BMW Group and Volvo), counting for 16% of total registrations. 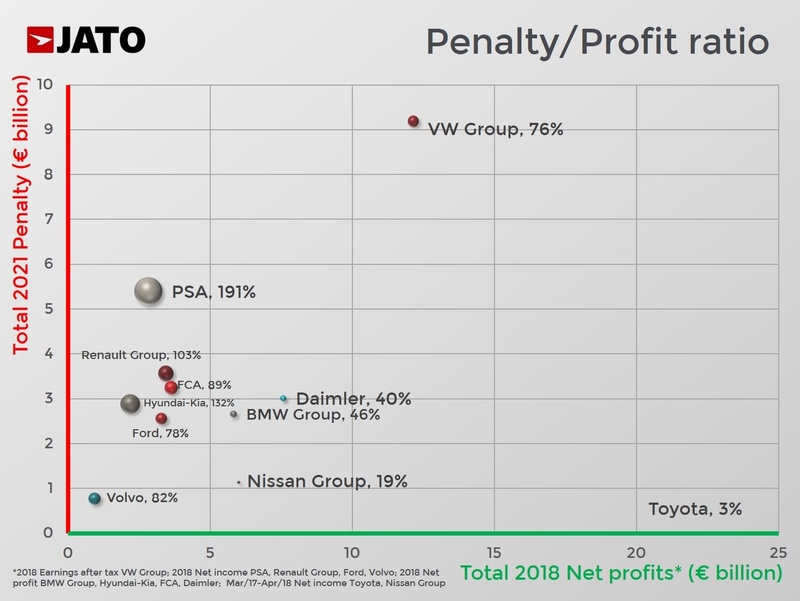 Volkswagen Group and PSA would be the most vulnerable. If the 2021 conditions were applied today (2018 results by sales and average CO2 emissions), and excluding any kind of eco-innovation credits to offset the total emissions, many car makers operating in Europe would be facing a very difficult situation. Based on our calculations and the latest FY-2018 financial results, the total amount of penalties would count for almost half of their combined net profits. Volkswagen Group would have to pay the largest fine of almost €2,525 per car sold. That comes to almost €9.2 billion. Last year the company posted earnings, after tax, of €12.15 billion. In other words, the penalty would be equivalent to three quarters of its latest annual global earnings. In PSA’s case the situation is a bit more complicated. The company, run by Carlos Tavares, is 23.1 g/km away from the 2021 target. Consequently, it would be obligated to pay a fine of €2,194 per car sold. 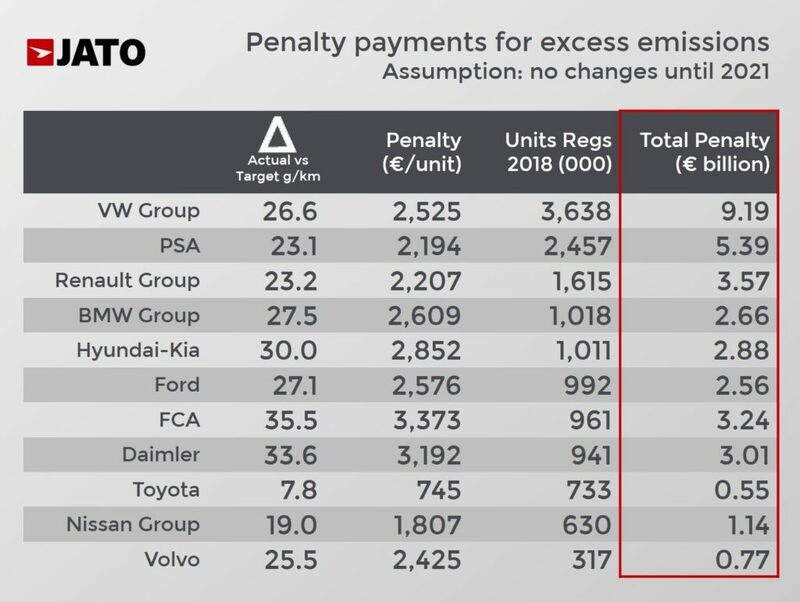 Based on its sales volume last year, PSA would need to pay a penalty of €5.4 billion – more than half the fine of VW. But the company posted a net income of €2.83 billion last year. On the other hand we have Toyota, which is operating at an advantage for two main reasons. 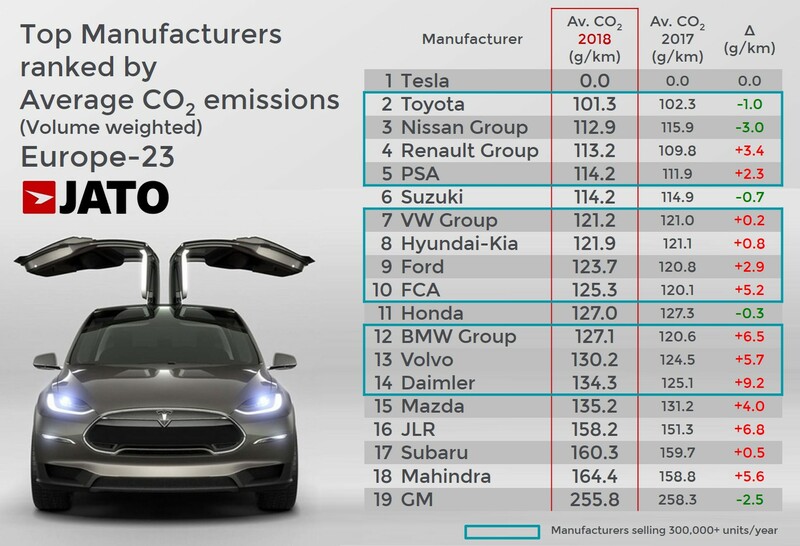 Firstly, it’s the big car maker with the lowest average CO2 emissions, mostly thanks to its hybrid range. Secondly, Toyota relies on Europe less than most of its competitors. Last year, this continent counted for only 8.5% of its global sales (excluding Russia and Turkey). And so its total fine would be €550 million, or 3% of its global net income of the period between Apr/17 – Mar/18. How to reduce the penalty? The conclusion of this study is the worst case scenario for manufacturers. We are assuming that nothing would change from now until 2021, and unfairly excluding the plans for electrification. 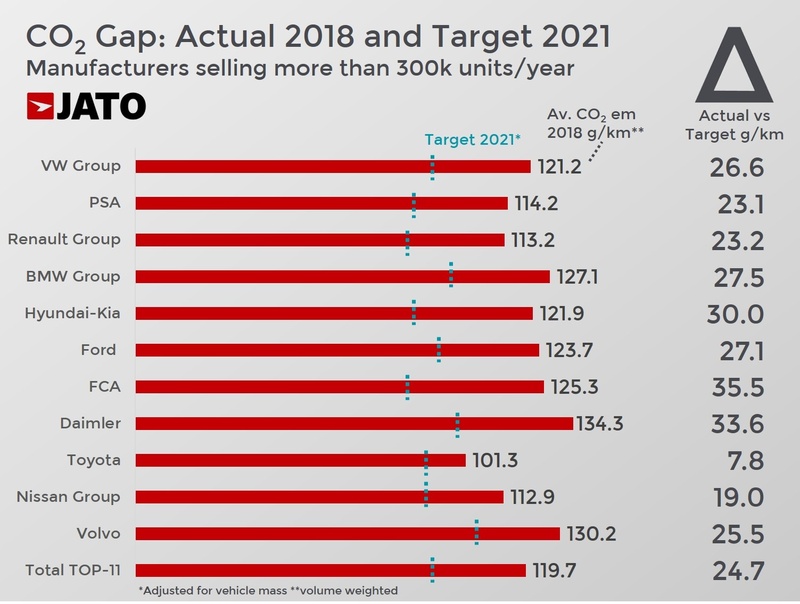 Effectively, OEMs can claim up to 7.5 g/km of CO2 from 2020 to 2022 to offset their total CO2 number for vehicles that meet the eco-innovation criteria. Moreover, we will definitely see many models dropped where investment to reduce their averages is larger than the profits generated. This will include the axing of more combustion engines, large and heavy cars, or those slow-selling models. To sum up, the manufacturers may have the technology to launch cleaner cars and alternatives to reduce the fines – their only limitation is time.